Participants in the TMT Science Forum 2016 in Japan. In May 2016, Kyoto and Tokyo, Japan were gathering places for TMT-related scientists, engineers, educators and public communications experts from around the world to discuss and plan the future for TMT. Discussions included science, instrumentation, workforce, education and public outreach opportunities for TMT, and it became clear that the project’s international collaboration is key to a successful future. On May 23, an open workshop on the Thermal InfraRed Instrument Concept for TMT, called MICHI, was held at the University of Kyoto. A Japan/USA research collaboration is leading the MICHI’s concept-study phase, and the aim of this meeting was to concentrate on the instrument science cases and foster collaboration between science team members. The thermal IR high resolution imager/spectrograph combined with a mid-IR adaptive optics system will afford 15 times higher sensitivity and four times higher spatial resolution than current-generation eight-meter class telescopes. This will enable many new frontier science applications, including enabling studies of the physical properties of star formation in regions deeply hidden in dust, at spectral and spatial resolutions unattainable by NASA’s James Webb Space Telescope (JWST), or today’s ground-based facilities. On May 24-26, the 2016 TMT Science Forum was held in Kyoto. Some 150 scientists from TMT’s international collaboration, consisting of the University of California, the California Institute of Technology, Canada, Japan, India and China, convened at the Kyoto International Community House, in the city’s heart of ancient, traditional Japanese culture. This year's TMT Forum was the first held outside the USA. 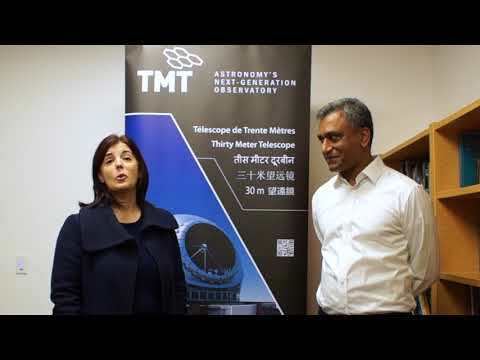 The meeting brought together science representatives from TMT’s project office and its international partners, a tangible demonstration of how the project has become a true international collaboration for developing the observatory and its instrumentation: The TMT International Observatory. The first two days’ plenary sessions presented the current status of the Observatory, its future strategy for scientific planning, and a road map of TMT’s future instruments. The status of TMT’s first-light instruments was reviewed and discussions extended on prioritization and planning for future generation instrumentation. A description of the instrumentation plan for the other Extremely Large Telescope projects (GMT and E-ELT) was also given at the meeting, highlighting possible synergies among their instrument programs. On the third day, the TMT International Science Development Teams organized parallel sessions. Their purpose was to provide a forum for open dialogue and debate on scientific priorities for second-generation TMT instrumentation. Among the many topics considered were solar system, exoplanets, star & planet formation, Milky Way and nearby galaxies, stellar physics and the interstellar medium, supermassive black holes, early universe, galaxy formation, intergalactic medium, fundamental physics & cosmology and time-domain science. A TMT Science Advisory Committee meeting was held in Kyoto on May 27, following the Science Forum. Science instrument updates were presented and each partner provided a progress report for their contribution to the project. The situation and timeline for having TMT built in Hawaii, TMT’s preferred site, was discussed in detail, as were possible other alternative sites, and their impacts on TMT science cases. On May 28-30, a Workforce Development, Education, Public Outreach and Communications (WEPOC) workshop was held in Tokyo. TMT’s WEPOC efforts have been integrated into the project at its early stage. The collaborators of this program are developing a global plan for representing all partners of the TMT International Observatory. For this purpose, the WEPOC group kicked off a new survey seeking to understand the workforce and education needs for anyone involved with TMT. Among the successful TMT-sponsored programs discussed was the Akamai internship program in Hawaii, a workforce initiative for Hawaii. This internship program offers college students an opportunity to gain summer work experience at an observatory, company or scientific/technical facility in Hawaii. Over the years, it will develop a workforce of scientists and engineers that will effectively contribute to the operations of future telescopes in the islands. TMT has been the cornerstone of this project in Hawaii for six years, and plans are underway to increase its international aspects.